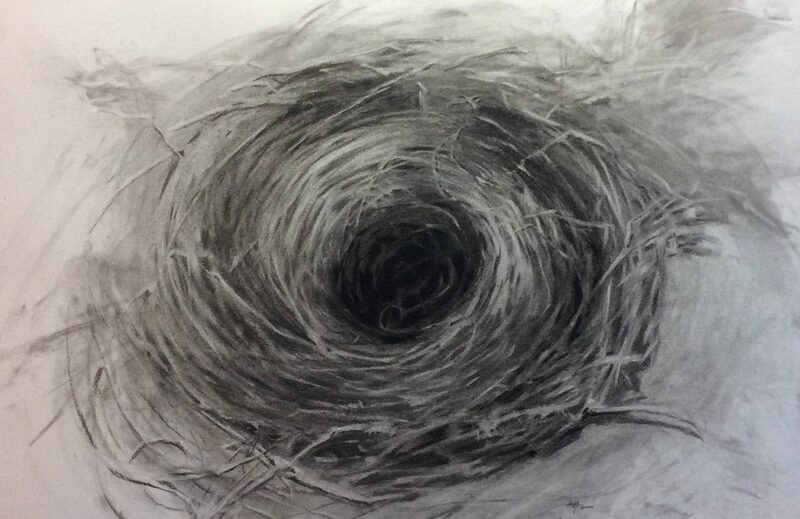 I have started on a series of drawings of nests. 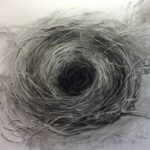 The first drawing was my second attempt at drawing the nest I had found in the backyard of our old house a few years back. 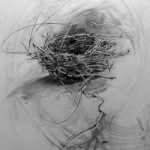 The first attempt at drawing the nest, months or years ago was a dismal failure. I remember thinking how it would be easy to draw this mess of lines because it was just a mess of lines. Until I started in on it and realized that each line actually has a purpose and had to be drawn. 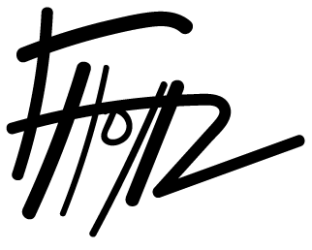 How do you go about drawing so many lines with such purpose? I do know artists who would thrive on such tedium but I am not one of them. And then the other day I walked by the nest and it struck me as the right time to try again. I had begun charcoal drawing again recently (portraits) and was feeling comfortable with the medium and had plenty of the all-important, very-erasable paper (it is hard to find). Drawing the nest this time was one of those memorable moments of focus and flow. I was making Art. Starting out with a messy ground of charcoal powder and a chamois sweep, the drawing slowly got tighter and tighter as I alternated charcoal marks with eraser marks and chamois sweeps to get a layering of lines and greys. 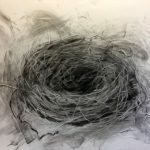 Top it all off with white charcoal on the highlights and boom; a nest I was happy with. Each mark had a purpose and yet each mark was not purposeful, not planned but put down in a process of building the drawing up. That much fun must be chased by more fun and so I have now done 3 nests and have in mind many more, including bringing coloured pastels in and perhaps even oil paint. A series. A body of work. You learn in art school that doing a series of pieces on one subject or train of thought is a good thing – a way to hone your technical skills and to develop a concept. 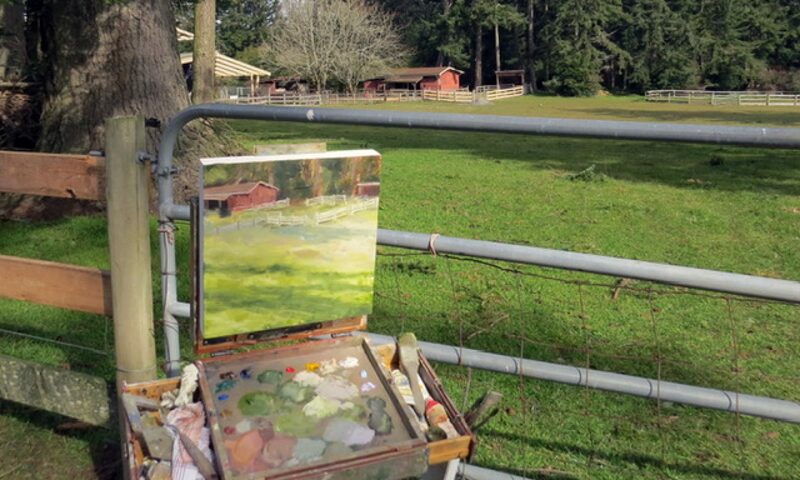 I suppose this is where I am going now – back to art school.